Home Ecommerce Platform Is Multichannel Commerce Dead? According to Forrester Research, multichannel organizational strategy doesn’t cut it anymore. 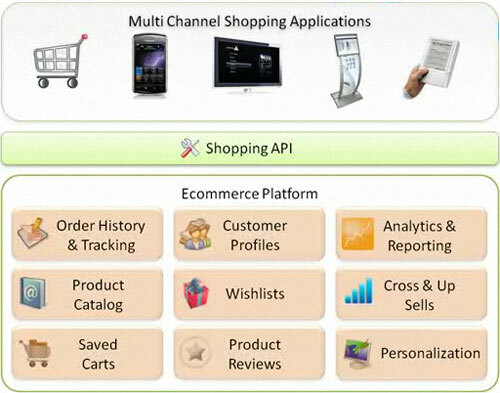 Today’s consumer doesn’t use channels, rather a variety of interconnected touchpoints – what Forrester has coined the “Splinternet” – which does not merely consist of web search, your website, mobile web, apps and social networks, but also offline “channels” that leverage web content from the commerce system. Interactive signage, QR codes in magazines and bus shelters, in-store kiosks, sales associates armed with tablets, and call centers that are more integrated with ecommerce technology than the “green screen.” Not to mention the variety of devices that support these interactions, from laptops to gaming consoles, interactive TV to (whatever’s coming next). An approach to commerce that enables businesses to optimize their people, processes, and technology to serve customers across all touchpoints. If you’ve been trekking with Get Elastic for a while, you may remember we were talking about the exact same concept we call “Mutichannel 2.0” nearly 2 years ago. Though the shift will be a slow one, now more than ever you should be thinking about what Agile Commerce means to your ebusiness. Know thy customer It all begins with a solid understanding of your customers. Why invest in technology and people before you determine what your customer expects today and will demand tomorrow? What touchpoints are consumers already using with you and your competitors, and where is investment most needed? Brian recommends customer journey maps, surveys, customer research and persona development to uncover this information. 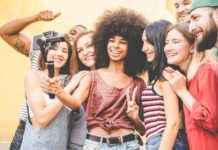 Invest in technologyThe vision of Agile Commerce / Multichannel 2.0 is to expose content (product info, video, product reviews) and web services (personalization, cross-sell/upsell) seamlessly across touchpoints. The commerce platform is the hub for them all, and can feed the spokes through shopping APIs. For some organizations, this means replatforming from tightly coupled “spaghetti architecture” systems to service oriented architecture that allows for swapping in and out of services. It also may involve shorter term point solutions like third-party mobile commerce platforms to ensure speed to market while the agile commerce platform is developed. (Note that point solutions do not always provide analytics that can be seamlessly integrated with other data). Rethink your org chartWhile the underlying commerce platform is critical, it will not “take you the whole way.” Unless channel-focused teams arrive at the place where the can say “hey, we’re all talking to the same customer – how can we work together?” Agile Commerce can’t be realized. Channels shouldn’t be cannibalizing each other. This likely requires some reorganization of people, as well as reporting systems, compensation and perhaps, company culture. Is Agile Commerce / Multichannel 2.0 right for every business? This depends on how critical touchpoint engagement is – some industries and organizations will have less need for or less complexity. Brian suggests the transition will be a slow-shift. Transition time may take a year to several years. Regardless, it’s important that you think through the impact the changing technological environment and consumer expectations and preferences will have on your business today and down the road. 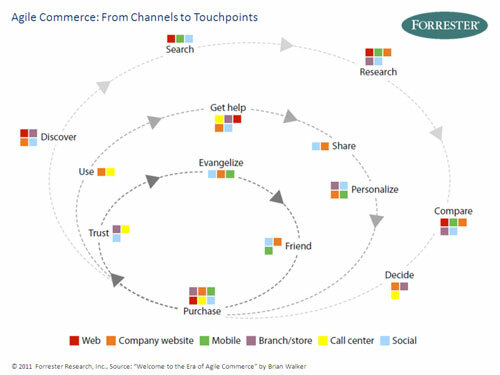 For further reading, check out Brian’s research report Welcome to the Era of Agile Commerce. Also helpful/relevant are The Future of the Ecommerce Platform and our own Multichannel 2.0 webinar recap.